African gray parrots are cautious, highly intelligent birds who don't warm up to strangers quickly. If they are not given proper care and attention, they can develop serious behavior problems, which is why so many grays are rehomed. Taking in one of these birds is a serious commitment that requires time, patience and consistency. 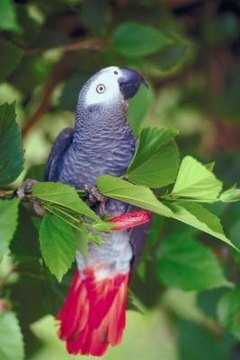 There are two subspecies of African gray, and the smaller timneh generally is considered to be the more friendly of the two. However, the timneh is still a highly sensitive, shockingly intelligent and potentially timid bird. In the wild African grays spend 24 hours a day with their flock, solve complex problems and often feed on the ground, which forces them to be highly alert to predators. A bird of this nature who is not properly socialized, mentally stimulated and trained can easily develop behavior problems, and when you adopt an older bird, you adopt the mistakes of his previous owner. It is possible to reverse negative behavior patterns and build trust with your gray, but it will take time. If you adopt a gray who has not been properly socialized, he may be fearful of new situations, strangers and even you. This may manifest in screaming, pulling out his feathers, becoming extremely territorial or being picky about food. It's not too late for an older bird to be socialized. Offer your gray his favorite foods, talk to him softly and don't make sudden movements toward him. Take your gray from room to room around the house while you do errands, and bring him on trips. Slowly introduce him to strangers, working your way up to passing him slowly from hand to hand, each person playing with him and giving him treats. Move objects and furniture around periodically so he gets used to change and learns that it isn't threatening. Offer him a variety of food and encourage him to try them by eating them yourself in front of him. The more experiences your gray has, the more confident he will become. Much like you need to be the pack leader for a dog, you need to be the flock leader for a gray. African grays who have learned they are in charge may become aggressive, bite, scream and generally ignore any instruction. You can change this behavior through positive training. Start by teaching "up," telling your bird to hop up on your hand. Lure him with treats and reward him well when he does as you tell him. Ignore any bad behavior. You should teach "down', stepping off your hand, "no" and "OK." These four basic commands will put you in greater control of your bird and improve your social standing in his eyes. Keep training sessions short, 15 to 20 minutes, and conduct them in neutral territory away from his cage. Never put your gray on your shoulder, as this puts him above your eye level, a nonverbal cue to him that he is above you in the flock. An African gray may bite for a number of reasons, including dominance, fear and a failure on your part to read his body language. Biting from a dominant parrot can be curbed by establishing yourself as the flock leader and offering plenty of positive reinforcement for good behavior. Grays are sensitive, so something as small as a frown or a calm "no" may be enough to stop biting before it starts once you've built a relationship. You can try laddering, instructing your gray to move from one hand to the other three or four times, to calm him down. Never yell at or startle your parrot, as this can harm your relationship. Fearful biters should be gently socialized so they no longer feel threatened by you or other people. You should learn to read your bird's body language, for example flattened feathers indicate fear and puffed feathers indicate aggression, and respect when he is uncomfortable. Trying to pet him when he is agitated will result in a completely expected and justifiable bite. Some African grays in need of rehoming are well adjusted, pleasant birds who need to be relocated due to outside circumstances, but many are rehomed due to bad behavior and owners who didn't know how to handle them. With time and patience your adopted gray can be a loving and confident pet, but make sure you are willing to make a significant time commitment and deal with potential behavior problems as they arise. Up At Six Aviaries: Nurturing Guidance What Is It & How Does It Work?